takes the celebrity-lifestyle genre down to the asphalt." gardeners, mailmen, and next door neighbors! "Mary Tyler Moore -- she's the cheapest one I've ever seen." Robin Williams' Neighbor, his Gardener, and a Delivery Guy "They're just my neighbors like anybody else." "He was here a month ago. He's fine. What does Gloria Estefan look like in person? "Short," says the gardener. "I always see them driving by." "How are you doing? Nice to see you." "We see a lot of people." "I'm not in charge of security, I work security." Go trick-or-treating to the homes of Jack Nicholson, Raquel Welch, Barbra Streisand, Jimmy Stewart, Elizabeth Taylor, George Harrison, and Warren Beatty. "My ... my driveway? What do you mean about my driveway?" Now you can eat like the neighbor of a big star! The driveways of Gena Rowlands, Lea Thompson, and Joey Lawrence (Whoa!) Plus, interviews in Palm Springs and a Driveways Quiz. Meet the Man Behind the Palmcorder. Copyright © 1996/1997 John Cunningham ALL RIGHTS RESERVED. 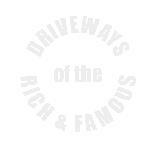 Driveways of the Rich & Famous is a registered trademark of John Cunningham. All persons and events in this program are real. No driveway was harmed in the production of this program. All images were recorded using a VHS-C Panasonic Palmcorder.